Turn on stove to a low flame. Pour sugar for caramel into your flan pan, place over flame, and allow to melt slowly until it reaches a rich amber color. Swirl the caramel around the flan pot until it covers the bottom and the walls, be careful. Once it is done, cover the pot and allow to cool. Place eggs, coconut milk, condensed milk, coconut extract and vanilla extract into a blender and blend well. Pour mixture into cooled flan pan. Then place flan pan into a double boiler (i.e. bain-marie or baño maria). Place in oven. When the flan is done, turn off the oven´s heat but allow the flan to cool inside the oven. Then place it in the refrigerator and keep it there until you are ready to serve it. 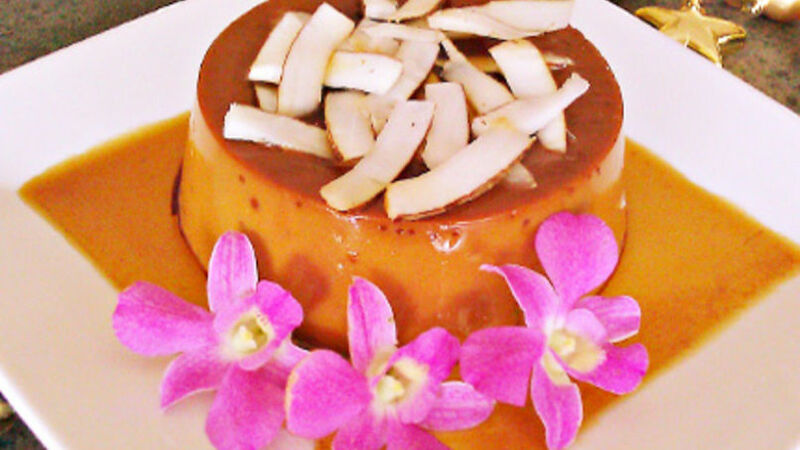 To serve the flan, invert the flan pot over a large plate and decorate it with the coconut shavings and orchids. It is best to use a double boiler so that the flan cooks evenly and slowly, and so that it maintains the creamy and delicate texture we all associate with this dessert. Since Christmas and New Year´s Eve are right around the corner, it’s a good idea to have a few recipes ready. This coconut flan recipe is one of those classic desserts which beguile us with its rich taste, and which combines so well with so many Latin ingredients and tastes. Flan, in fact, can be traced back to the ancient Romans who used to prepare it with pepper instead of salt. But it really gained popularity in the Middle Ages during which it was commonly served during Lent. This dessert was introduced to us by our Spanish ancestors and now is a common and well-loved dessert suitable for many occasions. On a personal note, flan always reminds me of my grandfather, a madrileño, whose favorite Sunday dessert was the flan de turrón served at the Club Asturiano de la Ciuidad de México. It’s that recipe which inspired me to create this Flan de Coco – a fusion of my husband’s Caribbean heritage and the rich flan of my childhood. Let´s cook!